Lovely, clean, self-contained second floor unit with private balcony that overlooks a private swimming pool which is located in the safe secure area of the hotel zone. Linens and dishes in unit are clean and ready for guest use. Condo complex is professionally managed and the surrounding grounds and gardens are well kept for added beauty and tranquility. Condo unit is very comfortable and situated in a quiet complex. 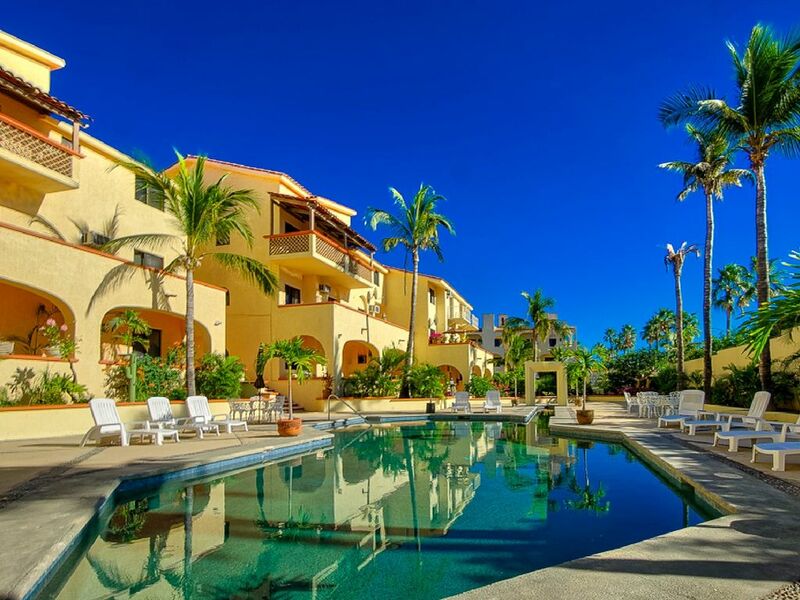 I decided to buy a vacation rental in San Jose Del Cabo because of the beautiful surrounding area and the easy access to recreational activities. The residents and guests in and around San Jose Del Cabo are friendly and welcoming of others. Beautiful beaches a short walking distance from my condo unit allow guests to rest without interruption. While staying at my property, you will enjoy all the comforts of home set in a safe, secure complex in beautiful Baja Mexico. Items required for a comfortable stay are included in the unit...just bring your clothes and toiletries! Catch the local transit bus across the street and ride to Downtown in under 10 minutes, or opt to walk to the Downtown area! Walk across the street and onto the Beach. Turn left and walk to La Playita where Restaurants, Cantinas and the Marina await. Turn right and walk to Zippers - a great Cantina meters from the water! A 15 minute drive out toward La Playita and into the country and you arrive at Flora Farms - an organic Farm with a Restaurant, Wine Bar, etc. A must see! Ample shopping in Downtown San Jose Del Cabo. Condo complex backs on to a golf course fairway! View the Fairway from the Kitchen Window and rear patio. All Bedroom, Bathroom and Beach Tower linens are supplied. one secure parking stall assigned! Electric Coffee pot, Coffee Press and hot water kettles are in the Condo. Drinking water, Coffee and Tea initially supplied to incoming guests. Ample supply of dishes and utensils, storage containers, pots and pans. Includes a Slow Cooker/Crock Pot, toaster/oven, microwave, blender, ample cooking utensils and a George Foreman Lean Machine grill. Catch all the news back home! Large cache of Fiction and Non Fiction Books in the Condo as well as magazines, maps and information of the Los Cabos area. Balcony overlooking the Pool with tables, cushions, umbrella and chairs. NO SMOKING please! Bicycle Rental outlet is less than a 5 minute walk away. Front - Patio with a Table and 2 chairs. Rear - pool facing Terrace with newly constructed U-shaped Bench. Condo complex backs on to a Fairway! A private pool is for the exclusive use of guests staying at the Condo Complex. Exclusive use only to Guests in the Complex. Not currently heated. Great location and perfect pool! We loved the condo, it was perfect for just the two of us, and once we figured out the bus system, a quick walk or bus ride to pretty much anywhere. The little extras like a beach umbrella and cooler really made the difference. Kenny was also super patient and helpful when getting prepared for our visit. Thanks for sharing your home away from home with us! I am so pleased to hear that Mariann enjoyed her stay! Hope to have her return soon! Close to beach and amenities. Bus runs right outside. Condo has everything you need. We had a wonderful stay at Kenny's condo! It was the perfect size for my boyfriend and I! Loved that we could walk across the street to the beach! It was very quiet and close to many shops and places to eat! The kitchen had all the cooking utensils we needed! Loved the Mexican charm of the condo! We will definitely stay again! So glad to hear our most recent guests enjoyed their stay! Customer satisfaction to me is number #1! This cosy one bedroom is right across from the beach access in the ‘Hotel Zone’ in San José, about a 15 minute walk to the big grocery store and 25 minutes from downtown San José. Access arrangements were very clear and easy; Esther, the Aloha property manager,drops by with a great orientation right after you arrive. Bed’s comfy; shower is great and the kitchen has everything you might need. A/C is very efficient; we used it only at night as the street traffic is a bit bothersome with the door open. Otherwise, there is always a lovely breeze through from the golf course or the beach. Had an excellent time. Thank you for the positive feedback folks! Even though your stay was very short, we ensure that no matter how long the stay will be, all Guests can be assured that all steps will be taken to ensure the condo will meet any expectations you may have. Cannot emphasize enough, the importance of making it a home away from home for all who visit. I am also glad to hear that the Brand new A/C unit did not disappoint! Very relaxing. Perfect weather and location. Everything was exactly how it was described and Ken and Esther was very pleasant and helpful all along the way including accommodate us with our early arrival. A/C did make some loud noise on our last day but breeze was so nice that did not need to use it. Esther also e-mailed us that she will take care of it next day. Thank you for everything and definitely recommend it to anybody who want vacation rental in cabo. Always nice to hear that guests enjoyed their stay! Condo Unit is within walking distance to a 125 acre Estuary- habitat of 200 species of birds. Organized expeditions and ecotourism trips of southern Baja are available. Unit is conveniently located in the hotel zone of San Jose Del Cabo, with ample Restaurants, Coffee Shops, Rental Car Outlet and a Convenience Store. Less than a (5) minute walk to a beautiful quiet beach, a (10) minute walk to a major supermarket and mall. A (15) minute walk to San Jose's quiet central plaza which features shopping, numerous art galleries and weekly art walks. A fully refundable $195.00 (CDN) damage deposit and a $64.00 (CDN) departure cleaning fee will be applied to all bookings. Please note, only a minimum stay of 3 nights will be accepted.